After talking about how Marine Ramp played out in the classroom with another geometry teacher, she decided to try it the next time our classes met, and I revisited it. Level 4: I can use trigonometric ratios to solve non-right triangles in applied problems. Level 3: I can use trigonometric ratios to solve right triangles in applied problems. Level 2: I can use trigonometric ratios to solve right triangles. Level 1: I can define trigonometric ratios. We went back to the Boat Dock Generator to generate a new situation. I sent the poll, and the responses were perfect for conversation. And had great success with the calculation. So I asked if they were ready to generalize their results. And whether we were making any assumptions about the situation. As expected, they generalized with sin(18˚). And they didn’t really think we were making any assumptions. Except a few about the tides. And that the height was the shorter side in the right triangle. Which was the perfect setup for the next randomly generated situation. While students worked on calculating the ramp length, I heard lots of evidence I can make sense of problems and preservere in solving them … lots of checking the reasonableness of answers. “No – you can’t do that.” “That won’t work.” “Those sides won’t make a triangle.” And I think it’s telling that no response came in that calculated with the sine ratio. So were you making any assumptions? And that assumption was … ? We assumed you could always use sine. But this time, using the sine ratio didn’t work, so we used cosine. We talked about the smallest answer. How did you get 26.8? We did the Pythagorean Theorem and then rounded up to be sure the ramp would meet the floating dock. After looking at the Boat Dock Generator, most of the class decided they might not want to walk on that ramp. 27.9 came from using the cosine ratio. Would you feel more confident on that ramp? Will the cosine ratio always work? We ended wondering whether we could generalize what will always work, given the maximum ramp angle, the distance between low and high tides, and the distance from the dock to the floating ramp. Next year, we will go farther into generalizing, which might look something like this. We started our Right Triangles Unit with Boat on the River, and we ended with Marine Ramp. More than any other year, students had the opportunity to actually engage in many of the steps of the modeling cycle – a big change from how I used to “teach” right triangle trigonometry through computation only. I didn’t realize I was playing tag. But apparently I was, and I got tagged. I noticed Dan’s Preview Post right before a long weekend. I spent the weekend thinking on and off about the problem. As promised, Marine Ramp Makeover was published a few days later, just in time for our try-a-bigger-task day in our Right Triangles unit. So we tried it. We started with the image. What’s wrong with this scenario? We watched the video, which ends with this image. Which one is worst? Why? Which one is best? Why? Students brought up the need for safety, which led to building codes and minimum standards. So I told them the standard. The slope of the ramp can’t exceed 34%. Students thought individually about what that means. We watched the video again. We saw a triangle that we hadn’t all noticed before. What does it mean for the slope of the ramp to not exceed 34%? I heard all sorts of things … the angle of the ramp is 34˚. 34% has something to do with 34/90, since the triangle is right, 34% has something to do with 180˚ or 360˚. How would you get this conversation back on track? I drew a right triangle and labeled the vertical and horizontal legs as 3 and 4. What is the slope of this ramp? What is the slope of this ramp as a %? Would you want to walk down this ramp? How can you figure out the ramp angle? What does it mean for the slope of the ramp not to exceed 34%? So what is the ramp angle? So the ramp angle has to be 18˚ or less. What other information do we need to know to figure out the length of the ramp? Talk with your team to decide what you want to know. Side lengths of the triangle. What side lengths? Both legs. Do you need both legs? We need the brown thing. Is that enough to figure out the ramp length? What does the brown thing represent? The rise. And there literally is some rise here, right? On the water. Oh! The rise changes with the tide. So the distance between low and high tides is 5.0 m. What is the length of the ramp? Everyone didn’t pay attention to the reasonableness of their results, of course, as the poll results showed. Does 55 work for the ramp length? We went to the Boat Dock Generator to try it. Maybe not such a good dock. It’s not wrong. But it’s inconvenient. Do you really even know it works past the part of the screen we can’t see? We built it. They were satisfied. So we generated a new situation. And I sent a Poll. And a few students answered before the bell rang. NCTM’s Principles to Actions includes build procedural fluency from conceptual understanding as one of the Mathematics Teaching Practices. In what ways can technology help our students build procedural fluency from conceptual understanding? I wrote last year about using technology to develop conceptual understanding of Trig Ratios. This year, we started the lesson a bit differently. I read a while back about Boat on the River, a 3-Act that Andrew Stadel had published and that Mary Bourassa had used to introduce right triangle trig, but I had never taken the time to look it up. We watched Act 1 to begin the lesson. Students submitted what they noticed and wondered. Then we thought about what information would be useful to know, along with thinking about what information would actually be reasonably attainable. For example, many bridges are made to a certain standard height or have the clearance height painted on them. This one is no exception … the bridge height is given in the Act 2 information. Students decided the length of the mast was attainable, too. And the angle at which the boat is leaning. Maybe there was a reading on the control panel. Students’ experience with right triangles to this point had been the Pythagorean Theorem, similar right triangles/altitude drawn to hypotenuse, and special right triangles. I told them we’d come back to the boat problem by the end of class. Students practiced I can look for and express regularity in repeated reasoning along with Notice and Note while first watching B move on the Geometry Nspired Trig Ratios activity and then observing what happened as I pressed the up arrow on the slider. Eventually, we uncovered that the ratio of the opposite side to the hypotenuse of an acute angle in a right triangle is called the sine ratio. We connected that to triangle similarity as our content standard requires. We checked the ratio of the opposite side to the hypotenuse for the right triangle they had drawn and measured. How close were they to 0.643? Students immediately noted that there was a problem with the ratios that were over 1 and talked about why. We continued practicing I can look for and express regularity in repeated reasoning along with Notice and Note to develop the cosine and tangent ratios. And then we went back to Boat on the River. What are we trying to find? What ratio could we use? How would we know whether the boat made it? When I cued up the video for Act 3, the students were thrilled to find out they were actually going to get to see whether the boat made it. And at the end, they spontaneously clapped. Someone asked me in a workshop recently how long a 3-Act takes. There are plenty on which we spend majority of a class period. Or even more than one class period. This one took less than 10 minutes of our lesson, but the payoff is worth more than our whole unit of Right Triangle Trigonometry. It gave us a way to develop the need for trig ratios that my students have just had to trust we need before. For these students, trig ratios don’t just solve right triangles; trig ratios can help with planning trips down the river. Coupled with the formative practice that students got during the next class, Boat on the River helped us balance rigor, one of the key shifts in mathematics called for by CCSS. And so the journey towards rigor continues … with thanks to Andrew for creating Boat on the River and Mary for blogging about her students’ experience with it and to my students for their enthusiasm about learning which made evident during this lesson through applause. I was invited to write a few posts for NCTM’s Mathematics Teacher Blog: Joy and Inspiration in the Mathematics Classroom. While you’re there, be sure to catch up on any other posts you haven’t read. There are some great ones by Matt Enlow, Chris Harrow, and Kathy Erickson. “Ask Don’t Tell” learning opportunities allow the mathematics that we study to unfold through questions, conjectures, and exploration. “Ask Don’t Tell” learning opportunities begin to activate students as owners of their learning. I have always used the Pythagorean Theorem to show why the relationship between the legs and hypotenuse in a 45˚-45˚-90˚ is what it is. But I think that’s different from “Ask Don’t Tell”. I have been teaching high school for over 20 years. And yes. I really used to tell my geometry students the equation of the circle. I told them definitions for special segments in triangles along with drawing a diagram. I told them how to determine whether a triangle was right, acute, or obtuse. And I told them the relationships between the legs and hypotenuse for 45˚-45˚-90˚ and 30˚-60˚-90˚ triangles. I’ve also been in meetings with teachers who have not thought about decomposing a square into 45˚-45˚-90˚ triangles or an equilateral triangle into 30˚-60˚-90˚ triangles to make sense of the relationships between side lengths. 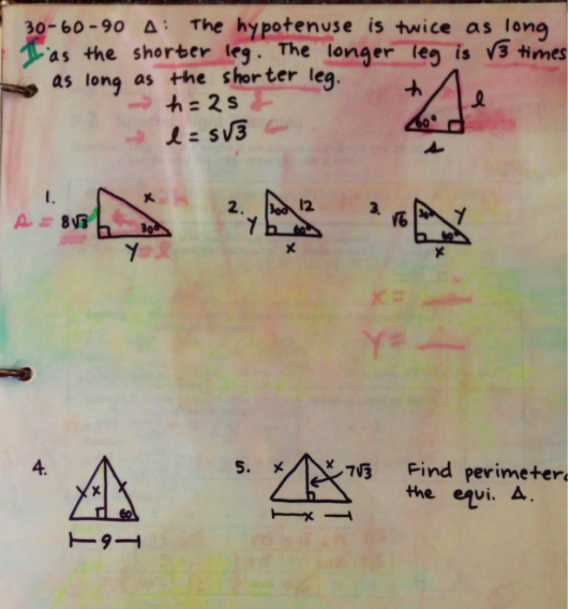 You can see on the transparency from which I used to teach that I actually did go through an example where an equilateral triangle was decomposed into 30˚-60˚-90˚ triangles; even so, I failed to provide students the opportunity to look for and make use of structure. Purposefully creating a learning opportunity so that the mathematics unfolds for students through questions, conjectures, and exploration is different from telling students the mathematics, even with an explanation for why. As you reflect on your previous school year and plan for your upcoming school year, what #AskDontTell opportunities do and can you provide?